On Tuesday 27 September 2016, the Asian Forum for Human Rights and Development (FORUM-ASIA), and its members Komisi untuk Orang Hilang dan Korban Tindak Kekerasan (KontraS), the Indonesian Human Rights Monitor (Imparsial), the Human Rights Working Group (HRWG), Yayasan Lembaga Bantuan Hukum Indonesia (YLBHI), Indonesia Legal Aid and Human Rights Association (PBHI), Sekretariat Anak Merdeka Indonesia (SAMIN) and Aliansi Jurnalis Independen (AJI) Indonesia hosted an anniversary reception for 25 years of FORUM-ASIA, ‘the Importance of Civic Space for Democracy’. The event was held at the J.S. Luwansa Hotel in Jakarta, Indonesia, and attended by some 90 people. In 2016 FORUM-ASIA turned 25. As part of its anniversary campaign, the network with 58 member organisations in 19 countries across Asia, interviewed and consulted human rights defenders from across the region and beyond on what the main challenges were related to the future of human rights in the region. Shrinking civic space was by far one of the most mentioned issues. Throughout Asia there seemed be, according to those that were consulted, shrinking space for civil society. Obviously, the more authoritarian the regime, the worst this trend seemed to be. However, several countries, that claim to be democracies, were considered to be increasingly cracking down on civil society too. One of the principal tools through which Governments in the region have been silencing civil society, has been the criminalisation of dissent. Threats and abuse of power, as well as the adoption of laws and regulations, that limit the freedom of expression (FoE) and freedom of assembly and association (FoAA) of those that are critical of the ones in power, have become common practice in many countries across Asia. The human rights movement in Indonesia has played, and continues to play, an important role in FORUM-ASIA. From being an inspiration for other countries when going through its Reformasi period to continuing to struggle for human rights and civic space in its new democratic era. It is a struggle that continues today, and that many need to be involved in. The event intended to give an opportunity for different stakeholders for the promotion and protection of human rights in Indonesia to discuss what can be learned from the past and how to move forward. To bring different stakeholders together that have a role to play in addressing these challenges, in particular the shrinking of civic space for human rights defenders. Finally, the event was intended to be an opportunity for networking and engaging, to meet old friends and get to know new partners. Instead of having more formal presentations, several people were asked to share some reflections during the event. The evening was hosted by Muhammad Hafiz from the Indonesia’s NGO Coalition for International Human Rights Advocacy – Human Rights Working Group (HRWG). The evening opened with a short video produced by FORUM-ASIA specifically for the occasion of the event. The video reflected on the human rights movement in Indonesia, the role of FORUM-ASIA, the specific significance of Munir Said Thalib and perspectives for the future of human rights in the country. https://www.youtube.com/watch?v=8gqCLb8IpdU&index=5&list=PLHkEyhqkjmhFFFWEiyysiBUwEw4tgeEvd. The first speaker was Haris Azhar, who has worked for KontraS, a nation-wide human rights NGO based in Jakarta, since 1999. He started as a volunteer for the Advocacy Division and continued as a staff member of the Monitoring & Research Bureau before going on to become Head of Documentation Research Bureau, Head of Research, Investigation and Database Bureau, and then the Vice Coordinator of KontraS before becoming the Coordinator in 2010. Haris reflected on the support and solidarity FORUM-ASIA has brought. ‘We never stand alone’, he said. The problems in Indonesia, they are reflected across Asia. Just three weeks before the event, Haris was threatened to be sued, solidarity came from across the region, including places like Cambodia, the Philippines and India. Such solidarity, which is one of the building blocks of FORUM-ASIA, is crucial in our struggle for human rights. ‘Especially now that human rights issues are not widely accepted in our region. But that makes them and our work even more important, they cannot be neglected. We have a huge challenge before us. We, the human rights movement may grow higher, but the wind will keep on blowing us down,’ Haris continued. ‘This means all our voices should be combined and focussed on advancing human rights. Our efforts must continue. And then, hopefully, in another 25 years, the human rights movement in Asia, including FORUM-ASIA, will be bigger and stronger than ever’. The second to take the stage was Dr. Todung Mulya Lubis. Dr. Lubis is one of Indonesia’s leading human rights lawyers and influential legal thinkers. He has been a senior Adjunct Member of the Faculty of Law, University of Indonesia since 1990, where he was first appointed in 1975. From 1980-1983, he was Director of Indonesia’s famous dissident NGO, the Legal Aid Foundation. Dr Lubis is also Founding and Senior Partner of a prominent law firm in Jakarta and has been lead counsel in a number of major human rights cases. Dr. Lubis reflected on the state of human rights in Indonesia, how it has changed over the years, and what specific issues still need to be improved. In terms of standard settings for human rights mechanisms much remains to be done in Asia. Indonesia did indeed ratify most human rights conventions after 1998, which explains why civil society in the country might be categorised as an active, and vibrant community. However, many issues remain. The rights of in particular minorities are still being violated. Many improvements are needed, for example when it comes to the human rights situations in West Papua. Most of us are aware of the situation there, but it is not published widely enough. When it comes to another issue, the death penalty, much remains to be done still. Lastly, we still carry the burden from the past. Past human rights abuses, specifically from 1965-66, which should be considered genocide. ‘Under these circumstances in Indonesia, I am pessimistic that this administration will handle what needs to be done’, closed Dr. Lubis. Next to take the floor was Wathslah Naidu. Wathslah currently works as a gender and human rights consultant. Her women’s human rights activism began 15 years ago when she was a Law Reform Officer at the Women’s Aid Organisation and she continues to represent them as a member. Previously she worked at the International Women’s Rights Action Watch Asia Pacific, leading the regional and international advocacy programme, including jointly establishing the SEA Women’s Caucus on ASEAN. She has also spent four years with the United Nations High Commissioner for Refugees (UNHCR) in Kuala Lumpur and Hong Kong. She holds an LL.M in International Law. Wathslah recognised that she had a hard time speaking on the role of FORUM-ASIA related to democratisation in Asia overall, however, she did have something to say on FORUM-ASIA’s impact on the promotion of gender mainstreaming. She started by thanking FORUM-ASIA for promoting women’s rights and gender equality. ‘Violations related to gender issues, including inequality, misogyny, sexism and sexual violence, continue to be rampant in the region. It is essential to persevere in addressing and confronting these violations together, and an engendered FORUM-ASIA is an important part of this. To face and influence gender equality together’, she said. In closing, she thanked FORUM-ASIA for having opened the door for groups and initiatives involved in gender mainstreaming and women’s rights when it comes to engaging with ASEAN and all such entities in Asia. This sort of cooperation and collaborative partnership is what makes us be more strategic in our shared goal of promoting and protecting human rights in Asia. The final speaker was Edmund Bon. Edmund Bon is the Malaysian Representative to the ASEAN Intergovernmental Commission on Human Rights (AICHR). He is currently the head of chambers (civil), practising under AmerBON Advocates. He previously chaired a number of Bar Council committees, such as those on constitutional law, national young lawyers and human rights. Among other things, in 1998 he became advocate and solicitor to the High Court of Malaya. From 2004-2014 he was member of the National Human Rights Society (HAKAM) of Malaysia. He was legal counsel for the United Nations High Commissioner for Refugees (UNHCR) from 2005-2008, and Secretariat member, Suara Rakyat Malaysia (SUARAM) from 2006-2008. Edmund started his reflections by noting the need to recognise the importance to engage with human rights mechanism. ‘It is crucial to continue to broaden our network with all the entities’, he said. As a newly appointed AICHR representative, he committed himself to engaging with civil society organisations, starting with initial meetings on different human rights related issues. Edmund thanked FORUM-ASIA for its meaningful inputs and recommendations to the AICHR, even those that might not be feasible to be realised straight away. 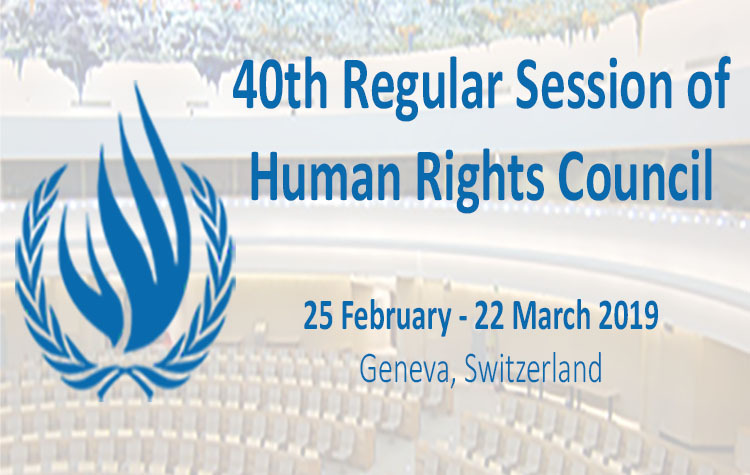 Institutions and mechanisms, like the AICHR, are crucial for the promotion and protection of human rights in the region, even if they are not always what we want them to be right now. Change takes time and engagement between all different stakeholders, all of us. ‘Thank you for giving me time to share my remarks. I hope to see you in the other meetings,’ he closed. To close the evening, Marte Hellema, Programme Manager Information, Communication and Publication for FORUM-ASIA thanked everyone for coming and expressed the hope that the togetherness of the evening would translate through to more collaboration and cooperation to promote and protect human rights in Indonesia and the rest of the region. The reception was attended by some 90 people, including representatives from various human rights organisations, Embassies, UN institutions, academics and media. For a full list of who attended the event, see below. During the event the anniversary exhibition, which was developed as part of the 25 years of FORUM-ASIA campaign, was displayed as well. All participants were offered a copy of the anniversary publication, ‘Our Struggle for Human Rights – 25 Years of FORUM-ASIA’, which was part of the same campaign. It added to creating a space for reflections, conversation, catching up with old friends and making new contacts to continue our struggle for human rights in the region.